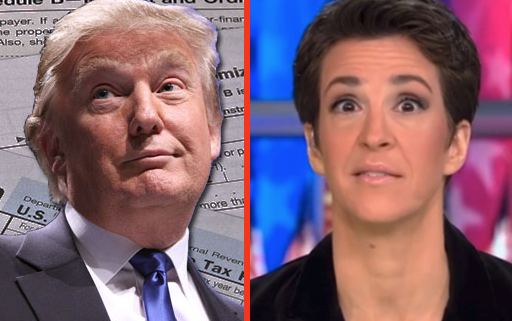 Rachel Maddow has Trump’s Tax Returns, and will air them tonight. Seriously. Rachel Maddow has been doing some truly exemplary reporting since Donald Trump took office, often moving past the rhetoric and examining the nuts and bolts of what is really being done behind the scenes. Trump’s tax returns have been something of a holy grail throughout the long election cycle, especially when he refused to share them last November. It was an unprecedented move, which at best tried to hide the fact that he hadn’t paid federal taxes for something like 18 years, and at worst could reveal global business dealings that present all sorts of conflicts of interest. Maddow has been experiencing a massive ratings spike, outrating every other primetime show last week. We have a feeling that trend will continue tonight. Tune in soon if you want to see this horror show play out in real time — 9 p.m. eastern time on MSNBC. Liberals clamor on about Trump’s tax returns saying they’ll show “how much he’s worth” and “who he owes money to” along with “what he owns”. These same people must’ve never filed their own tax returns or actually read a tax return. A 1040 shows none of that information. Your 1040 does not show your net worth, it shows your net income for the year. Billionaires could make a few million that year but it wouldn’t show their net worth. Also, a tax return does not show who you owe money to and what you own. That information would be found on a business’s balance sheet and not a tax return. Rachel Maddow’s show has lately consisted of saying she’s going to expose the Russian connection with Trump but when she does, her show never consists of facts and instead is littered with anecdotal information based around opinion. Something tells me that IF she does release any tax returns, they’ll be from over 10 years ago OR she won’t release anything because its against the law and she’ll instead tell you what she saw without actually showing anything. Actually it will show a great deal of itemization. It will list his business properties and any income or loss associated with them. Then there are his business debts and any interest payable. And it will show incomes from foreign investments, annuities, etc. Of particular interest is any monies from foreign governments, direct or indirect. Indeed it may take a forensic tax accountant to decipher it. @Dragonhawk1959 Tax returns show income and expenses. They do not show assets (things you own) or liabilities (debts you owe). Besides, if there was something nefarious in his tax returns our government would have seen that already considering they have copies of all of his tax returns. Getting in early to defend your tax-dodger mhoffman? Trying to rubbish a programme before it has even aired is a well known and ineffective ploy my friend. Obviously I can’t comment on what she will reveal – like you I don’t know. Unlike you I will not be trying to make any claims until I have facts. @natekerchel Looks like she isn’t revealing anything groundbreaking. Instead that he paid $38,000,000 in taxes in 2005 and took all of the legal deductions. MHoff, paid by Breitbart to come here and sway the gay. Do they provide you with talking points? Are you paid a salary or per comment, turning in your rabbit skins at the end of your shift? Um…what are even talking about? Automatically because someone disagrees with you on some things you automatically assert that I’m someone a paid person from some right wing online news organization. Plus, which “talking points” are you alleging that I’m pushing? I merely stated the facts which Rachel Maddow presented. Rachel Maddow essentially helped Trump tonight because she squashed the rumor that Trump pays no federal income tax (much like the author of this article alleged). Just because you’re mad that Rachel Maddow uncovered nothing doesn’t mean you have to take your frustrations out on others. natural reaction. Would have been the same had a liberal person done the same thing on some site like Breitbart or Fox Nation. Anyway, I’m more curious as to who leaked that. Who knows? Could have been Trump himself. Just saying. Well mhoffman I did say I will not make any claims until i saw the ‘evidence’. What we got was 1 tax return for 1 year more than a decade ago. What it shows is that the White House colluded in its ‘discovery’ – in itself suspicious – and that while he paid that amount of tax, he did not pay the full amount he could have done. So I say – both sides have something to to point to. However, your claims against the two gentlemen you mentioned are up for scrutiny. You and your trump cohorts persistently use the tactic of reverse claim in order to justify something dodgy done by the usurper and his minions. In the case of the two men you mention it again does not stand up to scrutiny. If you are going to make a claim then you need to provide hard evidence for me to believe what you claim. Does this 1 tax return exonerate the usurper trump from the claim that he is a tax dodger – no. He paid less than he should have – the evidence is right there to see. What we want to see are the returns for the past 10 years. His refusal will be taken to indicate he is hiding something. He remains ‘ the tax-dodger’. No doubt they picked one of his best years since were talking many years ago and the question about his Russian ties are right after that year. My guess Bannon did the anonymous leak. This is all just too convenient. @natekerchel I’m not sure what your definition of a “tax-dodger” is but I’m not sure how you can classify someone who pays $38,000,000 in federal income tax (not including property tax, payroll tax, and local tax) as a tax-dodger. You went on to say that someone can’t make claims unless they have evidence. What evidence do you have to backup your claim of Trump dodging taxes? Are you saying because he legally takes the legal deductions to lower his income tax that he’s a tax dodger? I’m curious to hear what evidence you have to support your claim. Then you say, “He paid less than he should have”, how much should he have paid then according to you? If he did something illegal then the IRS would throw him in jail or fine him. What do you allege that he failed to pay? Again, you’re the one making claims without evidence. Yes mhoffman I do call call someone who uses even legal means to avoid paying full taxes a tax dodger. Perhaps I should use the term tax avoider – that is more accurate. I myself was advised by my accountant to use several schemes to avoid paying more tax. I refused. Not because I am a goody two shoes but because I believe that those who can pay more should pay more in order to help those less fortunate. The recent scandal emanating from Panama shows how these schemes are used by the rich and famous to avoid paying all that they should. Avoiding or dodging – same thing in my view. You say he took all the ‘legal deductions’ . You will now say that others – especially Democrats – have used the same deductions to avoid paying more. Not being a hypocrite I hold them to the same standard. I pay every single penny in tax that is required according to my income – I don’t try and avoid it. In this case I am talking about the usurper in the White House – not anyone else. He is a tax avoider at the very least in that 1 year. What else is being covered up for more recent times? Having done a bit more homework on this one return mhoffman this is what I can tell you – trump paid $5.3 m in federal income tax – $31 m in alternative minimum tax (something he wants to abolish) . Together that represents a tax rate of 24% – 3.5% below the average for higher rate tax payers. It also confirms the $1 billion tax write-off in 1995 – extended over 18 years. What the return does not show is the sources of income – both local and international. Now those are the facts – and not alternative ones at that. Unlike you mhoffman I understand the difference between fact and opinion, and I research before I claim something as a fact. What does Rachel have to say about the fact that Trump paid a substantially higher portion of his income (~25%) to federal taxes than the Obamas did over the last 5 years (~19%)? Where’s the outrage? 1. Trump paid about a 25% tax rate in 2005. 2. Democratic talking point that Trump pays no taxes has been shattered. 3. Trump paid higher rate than Obama, Sanders and Comcast (MSNBC parent company). It’s like the old metaphor of the child digging through a ton of horseshit because she’s convinced there must be a pony in there somewhere. ‘About25%’ is not 25%. It was 24% – 3.5% under what the average higher rate tax payer paid. And this is on an income in excess of 100 million. Who needs to earn that much money – excessive greed. You mention several Democrats – none of whom had anything near that income. As I said before – I apply the same standard to everyone – tax avoidance is tax avoidance whoever does it. Why do you think this 1 return suddenly appeared? The answer is likely to be because that is the best he can come up with. The past 10 years returns need to be seen to see the full extent of his tax avoidance. I am pretty sure that there is a whole lot more to find out and that’s why he refuses to disclose. The other people you mention have no problem in disclosing theirs. Why? Nothing to hide that’s why. I am sure you have heard the expression ‘two wrongs don’t make a right’ so you can give up using that to excuse the dodgy dealings of the usurper in the White House. You are deluded if you think he will still be in office in 2020 never mind winning any election. His real criminal ties to Russia and the satellite corrupt countries is bubbling up. @natekerchel You do realize the “average higher tax rate” of 27.5% you are citing is from the most current numbers and not 2005? In 2005, the average tax rate for high income earners was around 22%, so Trump actually paid more than the average at the time. Bad research on your part with those numbers. Also, you said you don’t make claims unless you have evidence but you seem to constantly make unsubstantiated claims. For instance, you call Trump an “usurper” which is someone who takes power by illegal force. How did Trump become President illegally? You then say he has criminal ties to Russia without providing any evidence. You seem to be having a meltdown right now over this information and aren’t coping well. Aaaand as expected the tax return was legit and anti-climactic. The ‘procuring’ was likely done from the White House and leaked – leaks are the one thing they excel at in usurper trumpland. I doubt there will be any prosecutions – same as there have no attempts to ‘lock up Hillary’ as he continuously promised. “likely”. I think you’re being too kind. Definitely is a term I would use. Tick -Tock criminal connections in Russia and Eastern Europe Usurper Trump. You get zero points for originality, my pathologically liberal European friend. The Breitbautistic crew is in overdrive today. Their short bus Disembarkment Syndrome has yet to subside and, yet, the keening banshees are loose and wailing. Hide your glasses before they shatter. Wow, you really contributed a lot to this discussion. Rather than admitting that Rachel Maddow is a laughing stock today by failing in her partisan attack, you proceed to compare those people who you dislike to those who are less fortunate than yourself and have to travel to school on a “short bus”. I guess you have no shame and will make fun of those with disabilities to put down individuals who don’t agree with you. I apologize to disabled people for lumping them in with Republicans. Not right. Perhaps time-machine would have been more sensitive. “Disembarkment Syndrome” is what I was grinning about when I wrote to you. I’ll give you this one, MHoff. You have many pelts about your belt, fur trapper. Here, hare, here. Maddow destroyed any credibility she ever claimed to have, and this reminds me of Geraldo opening up Al Capone’s vault. Pulitzer in Doc Maddow’s future, troll.